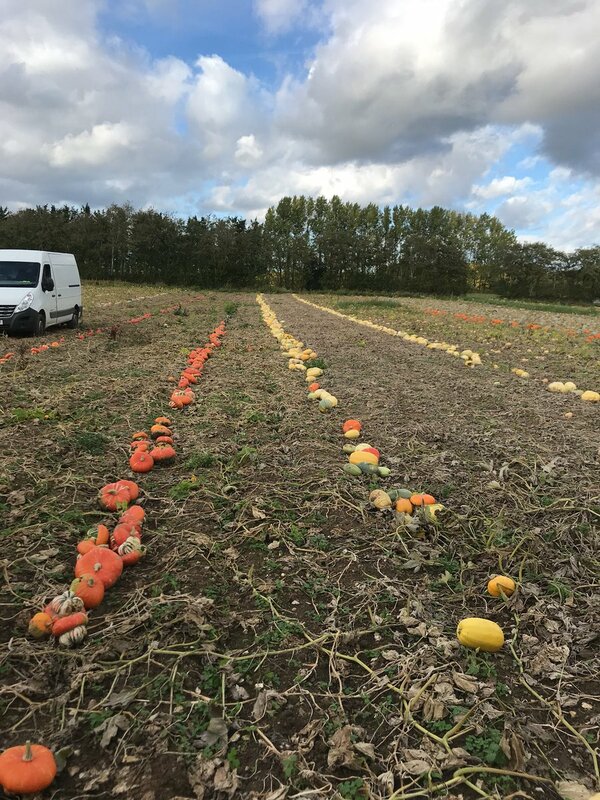 Harvesting of our store crops (potatoes, onions and squash) is in full swing; most of the onions are in store now, we have made a start on the maincrop potato harvest and have had a few afternoons windrowing our squash, ready to be picked up. We use secateurs to cut the stem from the plant, then windrow them ready for the tractor driver with box on the back to drive slowly along the rows whilst we play 'pass the squash' to get them in the box (no-one needs to go to the gym after a few hours of this job!). Our potato harvester was made in 1984, we bought it second-hand, and it's now showing its age! When nothing breaks, and the ground conditions are just right, and there's not too many weeds to block it up it's a wonderful bit of kit but very frustrating at other times. The summer drought and heatwave means our onions and potatoes are smaller than we would like, although some varieties of potato fared much better than others, with Arran Victory and Sarpo Mira looking good. The squash loved the sun, and ripened earlier than usual so should store well and taste sweeter than ever.